Amusement parks live in a similar realm to movies because they both use visual and audio techniques to convey a particular feeling. Even your local Six Flags park is creating a specific atmosphere; it just may not be a friendly one. This connection makes it interesting when the two worlds collide on the big screen. The crossovers aren't always great and are often painful. There are memorable exceptions to this general rule, however. These moments use this setting just right and enhance the main story. It's strange that there aren't more classic examples of amusement parks showing up in movies. It feels like there's more that could happen than what we've seen. For this list, I'm looking at movies shot at real parks or a set designed to resemble them. Futuristic creations like Westworld or Jurassic Park aren't what I have in mind. Let's check them out before we reach the next big drop! Located in Vienna's Wiener Prater park, the famous Wurstelprater park (known as Prater) appears frequently in movies. Its giant Wiener Riesenrad Ferris wheel even makes multiple appearances on this list. It's an excellent spot for romance since it moves really slowly and offers a majestic view. 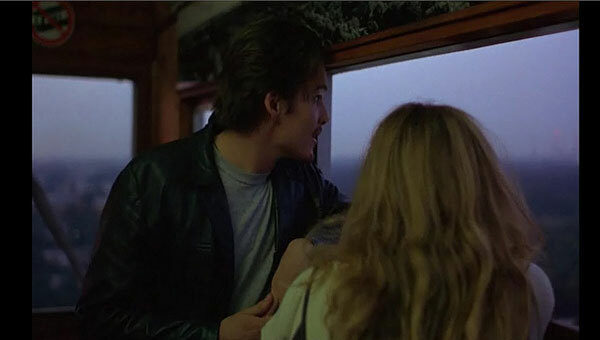 Richard Linklater's charming Before Sunrise depicts a growing connection between Jessie (Ethan Hawke) and Céline (Julie Delpy), who meet randomly. They spend an evening strolling through the city and share an intimate moment in this park. There's also a tender moment on this Ferris wheel in The Living Daylights with Timothy Dalton's James Bond and cellist Kara Milovy (Maryam d'Abo). This scene ends much differently with the murder of a key contact, but there's a similar feeling. It's such a change from its silly predecessor A View to a Kill and a step in the right direction. 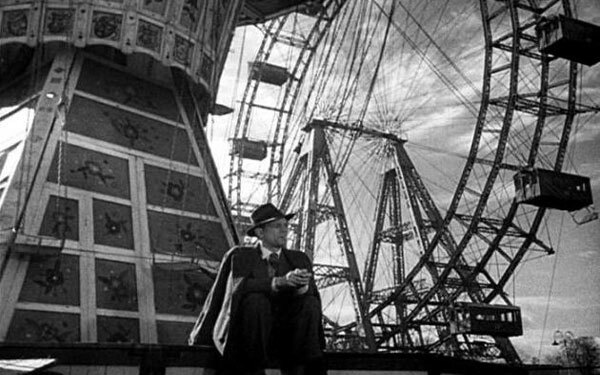 Constructed on a ranch, the amusement park in Hitchcock's Strangers on a Train is the setting for two of the best sequences. The first involves the homicidal Bruno's (Robert Walker) pursuit of his prey through a Tunnel of Love. Certain portions were shot on an actual fairground, but the transitions are seamless. When Bruno finally reaches the helpless woman (Laura Elliott) on the Isle of Love, it's a shocking moment. Hitchcock presents the scene as a reflection in her glasses, which just enhances the impact. 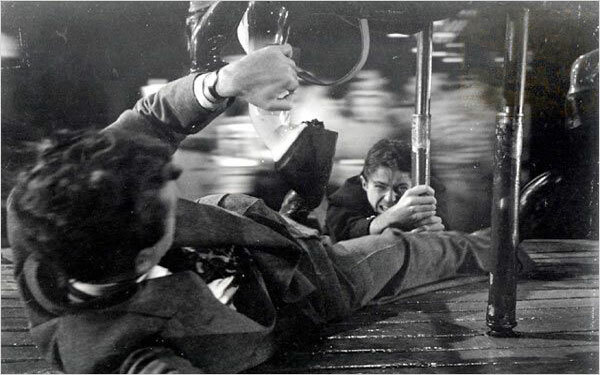 The other remarkable sequence involves Guy (Farley Granger) trying to stop Bruno on an out-of-control carousel. The crazy part is that a carousel operator actually crawled under the ride in a very dangerous stunt. While it spins right above his head, the guy lays flat and tries to stop the impending crash. It's one of Hitchcock's best films and uses the setting to its full potential. The classic road-trip movie, Vacation spoofs the traditional family trek to Disneyland in California. I can sympathize with the enthusiasm of Chevy Chase's Clark Griswold, who's more excited about the trip than anyone. He wills them all the way to their final destination and faces the ultimate disappointment from the happy moose. Shot at Six Flags Magic Mountain in Santa Clara, this massive park wasn't so over the top back in 1983 but still works for the movie. The Colossus and Revolution coasters that appear are still running today. 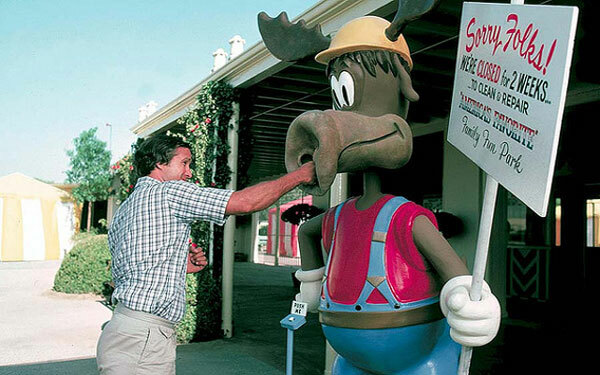 Although the scenes at Walley World only appear at the end, they make an impact particularly for theme-park fans who see a lot of Griswold in their own fandom. When I was in high school and college, I worked in the summers at the St. Louis Zoo in the outdoor stands that served snow cones and ice cream. Nearly everyone who worked there was young and didn't take the job too seriously. We were outside every day, and only now do I realize just how good we had it. Adventureland captures a similar feeling of being at the point just before the responsibilities of adulthood. Historic Kennywood in Pittsburgh plays the role of the fictional title park and is the perfect setting for the coming-of-age story. Writer/Director Greg Mottola (Superbad) clearly has a personal connection to the material, and that motivation is felt in every scene. Jesse Eisenberg plays the arrogant yet well-meaning lead perfectly, and it's just fun to hang out in this quirky local park. Joe Wright's 2011 thriller was one of the true surprises of last year. Hanna concludes with a showdown between the title character and Cate Blanchett's Marissa Wiegler. It takes place at an abandoned park with crazy-looking rides that seem even odder because they're no longer in use. 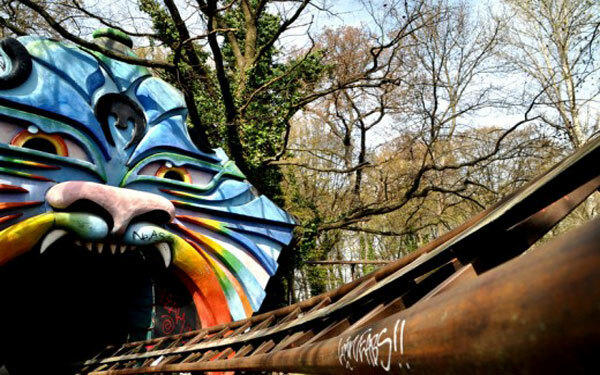 This place was the location of Spreepark, which originated under a different name in East Germany back in 1969. It closed back in 2001 due to huge debts, but some of the attractions remain in that spot. It's the perfect environment for the final confrontation between characters with lots of bad blood. The cinematography and art direction are striking throughout the movie, and this ending fits perfectly within this stylized world. I expect that more people will continue to discover this great action movie in the upcoming years. When I started compiling this list, there was only one possibility for the top slot. The conversation where Harry Lime (Orson Welles) explains his worldview to Holly Martins (Joseph Cotten) is one of the great scenes in movie history. While they ride the Wiener Riesenrad, Lime's candid statements about the "dots" walking below give a clear look at how a powerful figure can justify his actions. Setting this discussion at a place of amusement is perfect because it contrasts so sharply with his cold opinions. Welles only makes a brief appearance in this film, but it resonates so strongly that it's easy to forget the limited screen time. He receives one amazing scene, and that moment lifts the entire movie to greater heights. I'd love to hear your thoughts about this list. Did I miss the signature moments from Zombieland or The Karate Kid? What are your favorite amusement park scenes from movies? You should also check out past Top 5 Lists if you've missed them. Hanna! It was the first one I thought of under this theme. Yes! 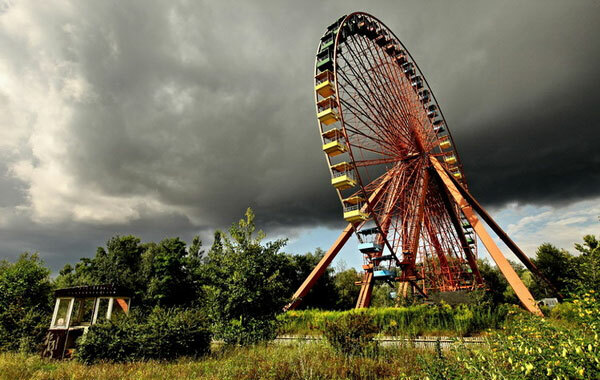 I'm so intrigued by that Spreepark. It looks like it was a crazy place even before nature starting taking over. Great list... I'd probably add most of "The Incredibly Starange Creatures [...] Zombies". It's a terrible film, but SO memorable. Awesome to see "Vacation" on there too. Kev, I know absolutely nothing about "The Incredibly Strange Creatures...", but it sounds intriguing. I did see that it has a really low IMDB rating (2.0!). I assume it's bad in a good way? Fine choices, Dan. I might put Before Sunrise in the top 5 over Vacation, but I love this list. Thanks Josh! I moved Vacation higher because it plays a larger part in the story, but I can't argue with flipping them. I'm a huge fan of Before Sunrise and Before Sunset. It's great that the characters will be back for a third time. Nostra, it was definitely on the short list and nearly ended up in the honorable mentions. I just couldn't find a good place for it. I agree that it's a great scene. Oh, what a fantastic list here. Love the honorable mention for Before Sunrise, that was such an enchanting moment. Strangers on a Train, The Third Man... no argument from me! Thanks Alex! I know that I missed some big ones, but there were a lot of great options for this list. I was surprised with Strangers on a Train that most of the park was built for the movie. That Hitchcock was onto something. I love seeing THIRD MAN and STRANGERS ON A TRAIN here. In fact, I could do a whole top 5 of just film noir. Just add WOMAN ON THE RUN, THE BURGLAR and THE LADY FROM SHANGHAI. All these have terrific amusement park climaxes. Martin, if I'd seen all those films, this list would have been impossible to put together. Maybe I should do a marathon? Glad to hear you liked the Third Man and Strangers inclusions. Those were easy choices and are such great scenes.